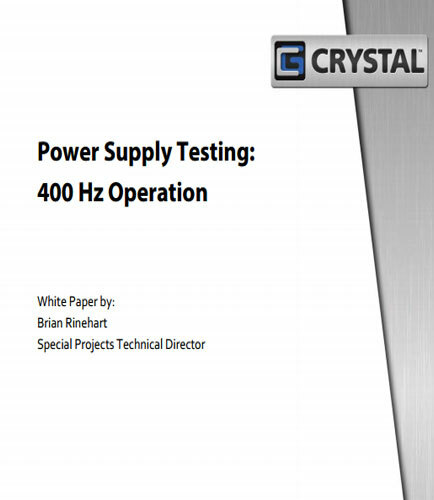 "Power Supply Testing: 400 Hz Operation by Crystal Group"
All of the power supplies tested passed the thermal, stress test, and low/high voltage operation criteria at 440 Hz. However, there is one very important parameter that must be considered in deeming a power supply appropriate for operation in a 400 Hz environment. This parameter is known as power factor, commonly abbreviated as PF. The higher the PF (desired), the lower the reactance and the more current is in phase with the voltage. The lower the PF (undesired), the higher the reactance and the more out of phase is the current with respect to the voltage.